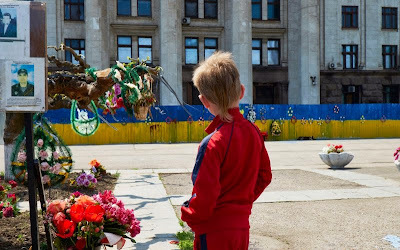 ODESSA, Ukraine -- On the one-year anniversary of the day Russians and Ukrainians clashed on the fiery streets of Odessa, terror attacks and “fake People’s Republics” are still worrying officials on both sides. On Friday, about 4,000 policemen, rapid reaction forces, and other Ukrainian law enforcement units marched and drove armored vehicles on Kulikovo Pole in the center of Odessa. Police officials explained that the parade was especially gaining the attention of terrorists and separatists, who were planning to destabilize peace in the city with a population close to one million people. Terrorism, a new trend burgeoning in Ukraine all year, intensified this week with a separatist underground, which was calling to split the war torn country even more and create “people’s republics” in Odessa, Dnepropetrovsk, Mariupol and even Kiev. Kulikovo Pole was a sad place for Odessits. One year ago on May 2nd, over 32 people burned alive or suffocated from carbon monoxide poisoning, trapped in the burning Trade Unions House in the middle of the square. Eight of them leapt from windows to escape the fire. Over a dozen more people were killed during violent clashes between Ukrainian patriots and pro-Russian separatists on the streets of Odessa that day. Weeks before the tragedy, Odessa—along with Donbas regions—was on the way to becoming one more rebellious republic, as anti-Kiev militia had built up their camp on Kulikovo Pole square and even elected a president of Novorossia. The horrifying fire destroyed the core of the movement, but apparently the separatist underground did not give up on attempts to destabilize Ukraine’s resort city on the Black Sea. In the past few months Ukraine was shaken by a series of explosions outside official buildings, public places and on railroads in Ukraine’s major political centers of Odessa, Dnepropetrovsk and Kharkiv. The most recent one destroyed a part of a railroad outside Odessa. Ukrainian security agency SBU was undermining and liquidating “a large scale separatist activity in Odessa,” agency official Markiyan Lubkivskiy wrote on his Facebook page on Friday. SBU officials also reported on a scenario to create “a fake People’s Republic” and destabilize the situation in Odessa involved corruption schemes and thousands of dollars in bribes. SBU detained at least 20 members of “deep underground network,” including activists of pro-Russian parties, as well as former employees of SBU and UBOP, the State Department for Fighting Organized Crime. SBU also reported detentions of activists calling to unite in the pro-Russian People’s Republic of Kiev. “The underground has no chance to act legally so they are involved in illegal activities. Some of them joined the Army of Novorossia, some are in underground preparing terrorist attacks against neo-Nazis and against a Junta law enforcement, or (they are) just sitting quietly waiting for the Army of Novorossia to come and free them,” Markov told The Daily Beast on Friday. The arrests of separatists didn’t necessarily put an end to increasingly aggressive pro-Russian underground movements across Ukraine. Russian social network VKontakte had a number of social groups calling for separatist actions and revenge for the Odessa tragedy. The page, which counts 660 followers, kept a record of all arrested anti-Kiev activists and criticized Ukrainian President Petro Poroshenko for being too pro-American and anti-Ukrainian, for canceling the May 9th parade of WWII veterans, and for calling on Ukrainians to fight and free Crimea and Donbas. Russian experts in Moscow saw the crisis in Ukraine, as a dead-end situation. “American military is already on Ukrainian soil. Soon, the United States will deliver weapons of mass destruction to Ukraine, [and] that would escalate the conflict even more,” pro-Kremlin political analyst, Yuriy Krupnov told The Daily Beast on Friday. “At the moment there, nobody can find a solution, as rebels—even when Moscow orders them to stop fighting—are afraid that if Kiev takes Donbas back each of them will be lustrated or killed. And Kiev is never going to give up Donetsk and Luhansk and let them be Russian,” said Krupnov.